I have been anxious to try these outs, and after store hopping, I finally found the one that I was wanting at Walgreens. This pattern is called Check It Out. 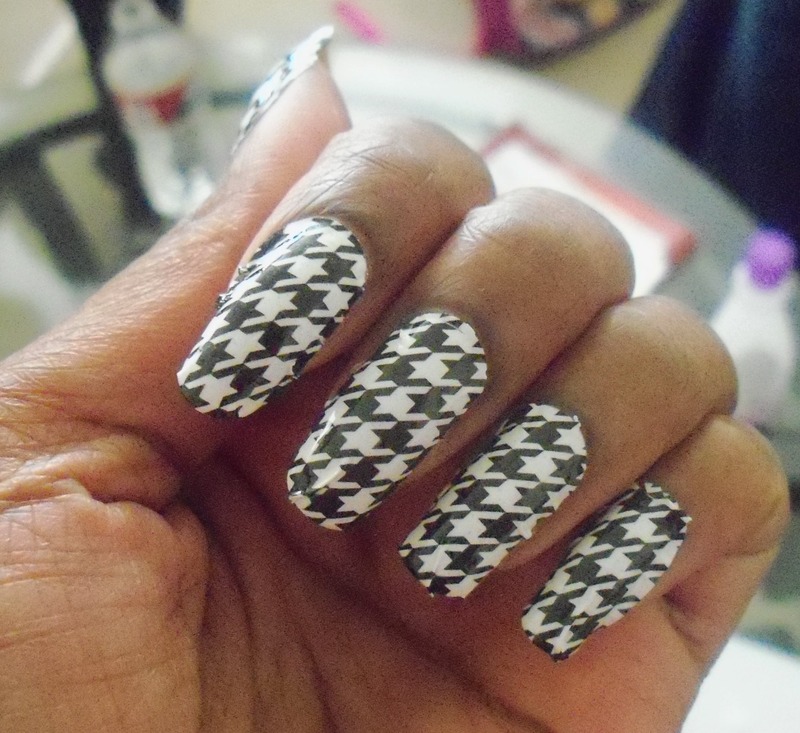 It’s houndstooth, and I love it. What drew me to these besides the interesting effects, was the fact that I didn’t have to wait for polish to dry! That can be tedious, and I usually end up smudging at least one finger. Like I have said before, I’m not into nail art, but I couldn’t resist this. There are 16 strips that come in the package. I thought that was great for mess ups. 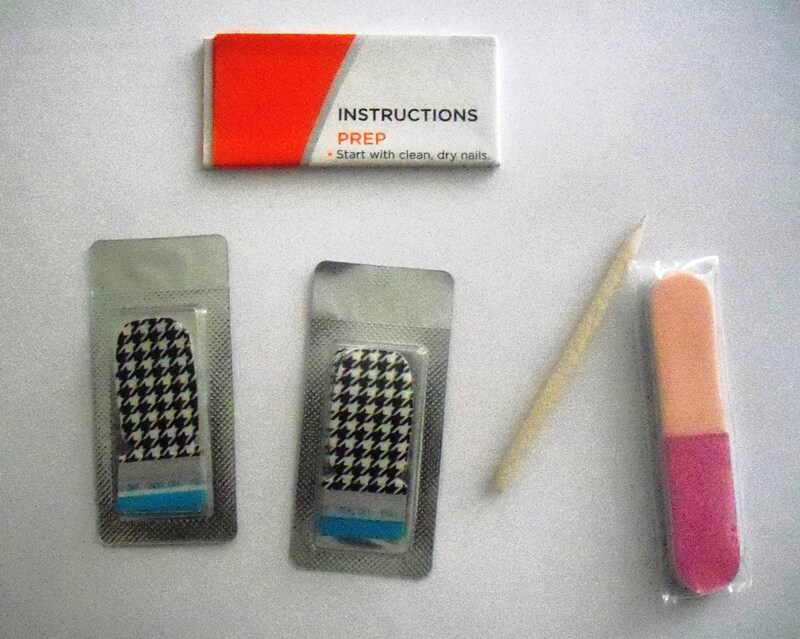 It also comes with a cuticle stick, and a nail file for buffing away the excess. Gently smooth surface of nails with gray side of file. Give nails one last swipe of nail color remover to remove any excess dirt & oil. (This step is extremely important as it helps your manicure last longer.) Ensure there is no creamy or oily residue left behind. 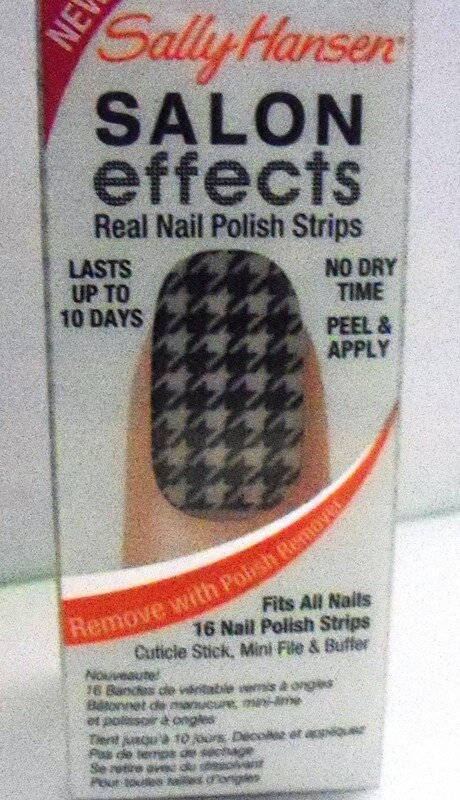 To remove strips, use nail color remover. Select best fitting strip for each nail. Remove clear protective plastic cover, then peel nail polish strip from backing paper. 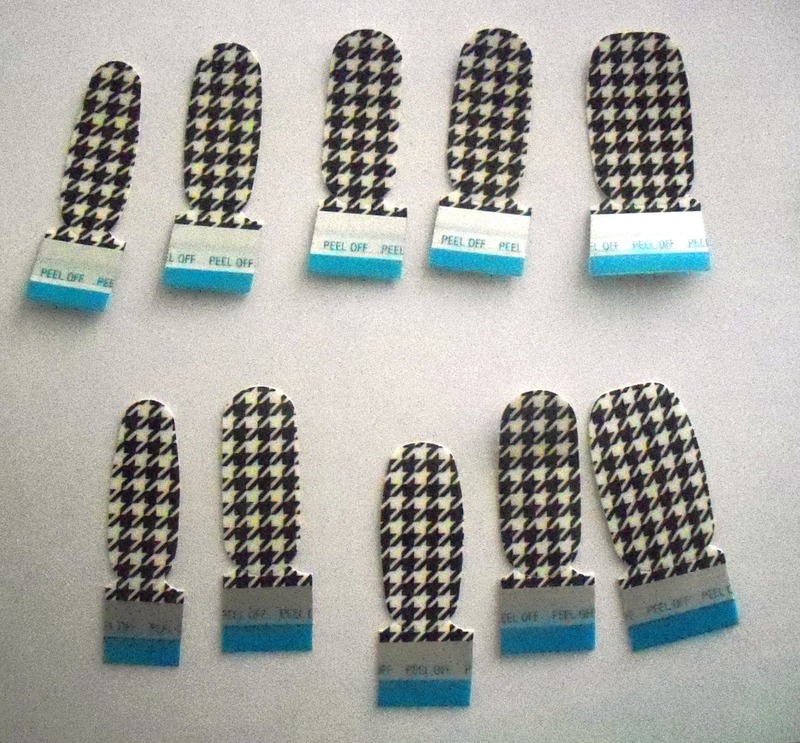 Choose the side of the strip that best fits the shape of your cuticles. Break silver tab from strip. Place strip against cuticle line. Hold strip at the center for maximum control. 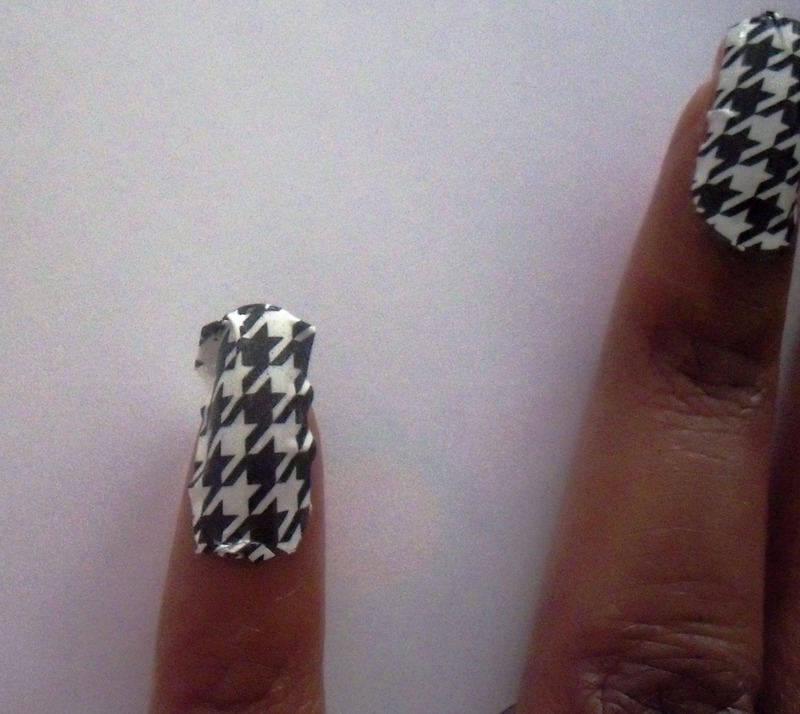 Smooth excess over nail edge, forming a crease around the edge of the nail. Gently file away excess from nail edge using light pink side of file. Picking out the right size strips and sizing them on my fingers reminded me of going to get my nails done, when the nail tech is sizing up the acrylics for my nails. That was the only part I ever liked, and it I”ll admit, it was kinda fun doing it today. Don’t mock me! Ok so, I had a problem applying the strips. They aren’t so flimsy and sticky that they are hard to manage, it was just that I had a hard time applying without having any creases or bumps. The nice thing about it is that if you haven’t pressed them down completely, you can remove it and reapply if you mess up. Notice the creasing. This was prior to the buffing. After a while, I just gave up on it and applied as best I could. I also had a problem with the sizing of the strips. Even though they appeared to line up perfectly, some were too wide for my fingers, or not wide enough, even after mixing and matching. Those extra six strips really came in handy, cause I had a few do-overs. I applied them all first, then buffered. I didn’t think that the nail file would do anything, but it actually cut the extra strips off perfectly. Except for the over hang that is on my fingers, and I’m still not sure what to do about that. After a few hours, I applied a topcoat, because I have noticed that where the creases are, it is starting to break down, and I can’t be having that! These strips are touted to last for 10 days, and I want to get every last day I can outta them. At first I wasn’t sure if I liked the look, but I got compliments to every store I went to today. One clerk had to apologize because she wasn’t even paying attention to what I was saying she was so caught up in the nails! I’m 50/50 on the repurchasing. I do like to do different things with my nails, but applying them for me was a hassle. For 9.99, I kinda expected a little bit more. Especiall since I go so hard for Sally Hansen. I think they would be fun for special occasions though.